Industrial fishing fleets have doubled the distance they travel to fishing grounds since 1950 but catch only a third of what they did 65 years ago per kilometre travelled, a new study from the Sea Around Us research initiative at the University of Western Australia and the University of British Columbia has found. 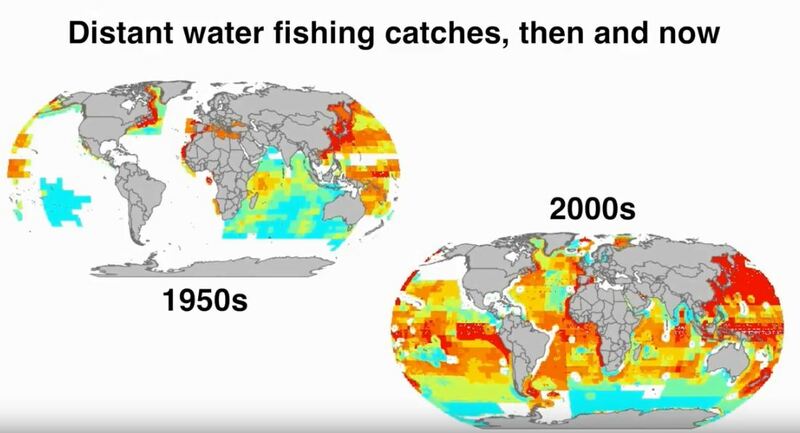 By mapping the growth and spread of industrial fisheries using the Sea Around Us data, the researchers found that these global trends were dominated by the heavily subsidized fleets of a small number of countries that have increased the total area fished from 60 per cent to 90 per cent of the world’s oceans. The researchers also found that these historical expansions were most pronounced along the coasts and archipelagic waters of Southeast Asia, Africa, South America and the South Asian subcontinent. According to the researchers, these findings are further proof that subsidies paid to industrial fishing fleets encourage inefficient and unsustainable uses of fisheries resources. “The data seem to indicate that we have reached the physical limits of expansion in capture fisheries. Industrial catches peaked in 1996, when the discovery of new stocks was no longer able to keep up with the declines in existing stocks, and have plunged since then,” said co-author Dirk Zeller, who heads the Sea Around Us – Indian Ocean at UWA. The paper “Far from home: distance patterns of global fishing fleets” was published today in Science Advances.